When you partner with SpeedPro for architectural glass signs, finishes and privacy panes, you get more than bright, light installations. You breathe new life into your old space. These decorative, specialty glass fixtures add something few graphics can. Balancing form with function and detailing with simplicity, natural light and appropriate levels of privacy, architectural designs are the goldilocks addition to your space’s graphic design — without the cold porridge too. Ready to reimagine how your office, storefront, restaurant, hotel, spa — you name it — can look? A little architectural glass finishing goes a long way. SpreedPro’s national network of visual communications and printing studios is here to show you how. Privacy glass goes by many names — frosted glass, etched glass, architectural glass, decorative windows, indoor glass partitions and more. Naming aside, these wide-format fixtures refer to glass-based surface prints that provide practical and/or aesthetic benefits to an indoor space — often simultaneously. You bring the idea, we bring the execution. SpeedPro studios take glass-based design features and turn them into fully formed visions that enhance the look and feel of a room. Architectural privacy glass comes with a suite of customizations. It’s a blank canvas, making a striking combination for signs, 3D logos, screens, walls, room dividers, cubicle partitions and more. Glass films: Glass films are decorative adhesive patterns applied to glass surfaces. They open up a whole new world of design and aesthetic possibilities for their plain glass template, from pops of texture to refractory embellishments to unique color striations. This versatility makes them a keen choice for wall branding or glass-finished signage displayed on strategic commercial walls. Adhesive glass films can be layered atop most smooth and clean glass surfaces, especially when the preference is specified at fabrication. Frosted glass: Frosted glass has its name for a reason. Signs, screens and walls fabricated from it hold a foggy and matted appearance that veils vision, traditionally by obscuring clear shapes and forms rather than blocking sight altogether. This opaque, shape-muddling surface is what gives panels with this finish type their “frosted” look. It’s great for architectural signage as well as interior and exterior windows alike, giving glass a classic, pearly plane. Tinted glass: Tinted glass is made of panels and screens chemically altered to change their base color. Both the shade and the density of the glass will be altered depending on tint, with functional benefits like UV-ray protection, heat retainment in the winter and cold retainment in the summer included. Tinted glass colors should not change or fade over time. For durability and climate control capabilities, tinted glass is commonly used in outdoor applications, such as embellishing contemporary building facades or as stylish fixtures on decks, patios and rooftops. Tinted glass films can be applied over a glass pane for simple and swappable coloration. Reflective glass: Reflective glass, or mirrored glass, is created by infusing a thin layer of metal into one side of the glass, then sealing it with a clear protective coat. The result can be a traditional or one-way mirror. Reflective glass carries a high-metallic gloss, high-sheen appearance with clear light and image refraction. When it’s installed for aesthetic touches, reflective glass gives rooms and fixtures a modern yet sophisticated feel. It makes smaller rooms appear larger and larger rooms brighter, amplifying spatial airiness and openness. For external applications, reflective glass deflects UV rays and is used for “curtain wall” facade glazing. Satin glass: One of our most popular privacy glasses, satin glass is clean and pearlescent yet holds one of the highest and most evenly dispersed opacities of all glass types. This high opacity lends itself well to obscuring shapes and images behind any partitions or panes, yet it won’t sacrifice its elegant appearance. This glass comes with a matte rather than glossy sheen and can be printed in various thicknesses. The thicker the satin glass base film, the more obscured images and light will be. SpeedPro studios know privacy glass benefits and designs. The glass finishing you select conveys just as much about your business or organization as it does about the building itself. Let us help you pick the right one for the perfect layered glass look. Architectural and privacy glass are made to transform your space. Every piece contains unique design considerations, branding conveyance and impact potential for employees and visitors alike when they step foot in your building. As such, each architectural sign, pane, display or divider made from privacy glass needs to be considered under three key design elements: color, pattern and privacy level. Glass coloration adds creativity and life to areas where it’s installed. Like pieces of art, these panes embellish room aesthetics or can be used as a branding vehicle, with architectural glass fixtures and pieces dyed to match an organization’s current on-brand color scheme. With tinted glass, the color is saturated straight into the base substrate glass using chemical-palette compositions. Yet colored detailing and glass films can be added onto a traditional clear or finished surface to create easy-care glass signage, mounted logos and more — or simply to add an extra pop of color to your room. SpeedPro studios can employ a color-matching process for glass to complement your current office decor. Similar processes can be completed to select and incorporate custom glass colors, with our representatives working with you to ensure you’re getting the exact colored glass you envision. Glass patterns are next in line for you to consider when you’re ordering your privacy architectural glass. There are two key purposes to patterned glass. 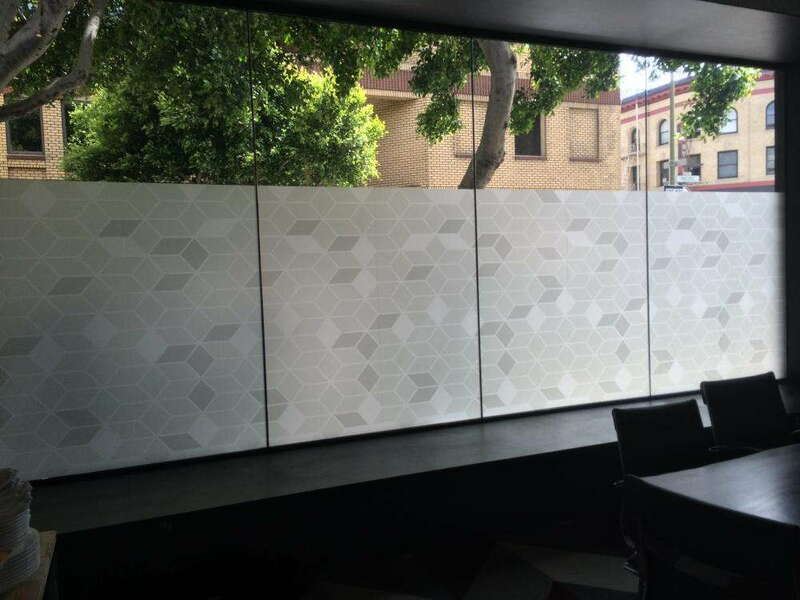 First — for the functionally minded — patterned glass adds extra privacy. Whether from glass films layered atop smooth substrates or through texturing of the glass itself, patterning work can amplify opacity and boost the pane’s privacy level. Second — for the artistically minded — patterned glass creates a one-of-a-kind visual statement. A fingerprint of sorts, glass with patterns can be used as art itself. 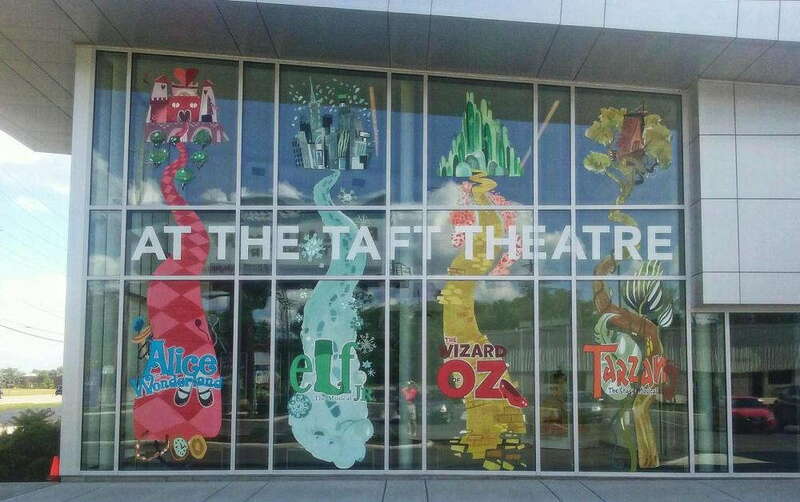 Films: As described above, glass films can create geometric patterns, lettering, logos, strips or complete images imprinted directly onto glass signs or panes. Custom finishes: Glass finishes are treatments that turn a glass’ surface into a pattern itself. For example, a course-grained finish can be fabricated into glass for a grainy, textured touch, while vertical lines or waves running down a glass wall partition can refract light and shapes for enhanced privacy. 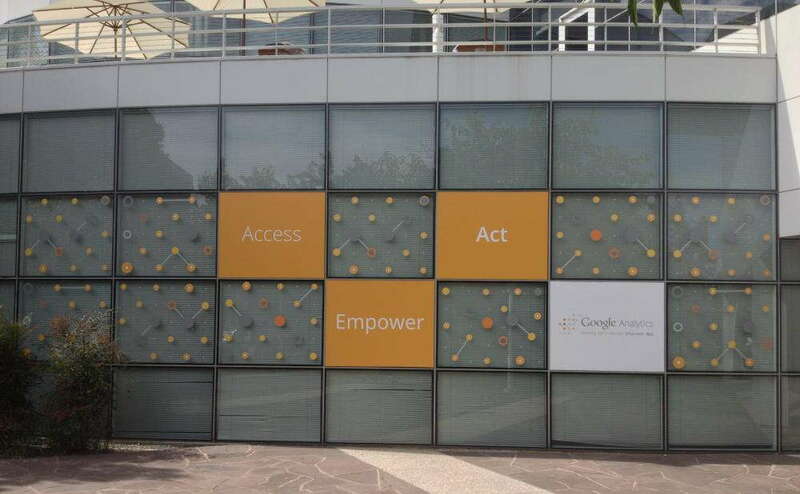 Wall and window murals and decals: Placing custom window graphics and wall decals onto architectural glass adds bright, bold and branded imagery for a high-impact location. Etching: Etching is a glass treatment process in which acids, chemicals or other compounds are used on glass to create visual designs. Etching can work two ways, creating translucent graphics on frosted or satin glass or, conversely, building a frosted pattern to break up a clear pane. Sandblasting: Sandblasting uses fine sand and other coarse particles to texture a surface. 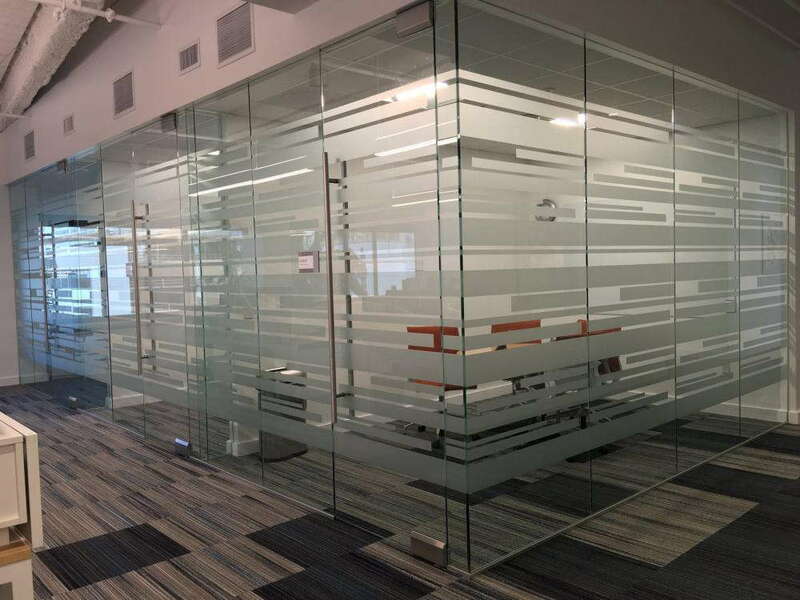 On glass, sandblasting treatments can create smooth, even and sleek planes or do the opposite, forming ridges, waves, lines and other textures. The privacy afforded by your glass finish is the final major design variable to determine. While certain glass bases and types innately distort visuals and create privacy barriers, not all of these finishes are made equal. For example, classic satin glass and darkly tinted glass may seem like equally good options to build the walls of a conference room within an open-concept office. Each will obscure direct lines of sight into the room, helping to keep meetings distraction-free. However, a slightly thicker satin glass may actually provide superior privacy and allow more natural light to permeate the room, while the natural dark coloring of tinted glass may only provide the former. To help consumers, many design studios use a numerical privacy rating with glass samples. These numbers relay the level of privacy a particular type of glass finish affords. Low numbers indicate that the glass is transparent and doesn’t lend privacy, and high numbers designate opacity, which gives a lot of privacy. Privacy levels six or above will distort shapes while still permitting some light and shadow. Those in the highest ranking, from eight to 10, may utilize additional colors, patterns and finishes to deliver a higher level of privacy. Additional treatments like films, etching and sandblasting can amplify or pull back a glass type’s privacy level. Few design elements transform your space quite like architectural glass. Its size, color, cut, pattern and placement options are endless. It can align to enhance current aesthetics or elevate what’s there into a fresh, bold new vision. This customization is only the first point on a long list of benefits that privacy glass and finished architectural designs can give. Here are five more. Privacy is at a premium in many workspaces today. Without it, office employees are shown to be less productive, less motivated and less comfortable in general. Sustained exposure to such an environment even leads to issues like absenteeism and higher rates of chronic employee sickness. Curtains and blinds add a homey touch to commercial spaces. Yet organizations wishing to step outside this traditional design mold often look for other lighting solutions, particularly ones that can regulate exterior sun and interior lighting all on their own. Tinted and satin glass provides a natural light-reducing barrier, while reflective glass can be installed outside a building to further reflect and deflect unwanted amounts of light. Plus, office and commercial draping can be expensive. Custom orders of architectural glass designs have longer lifespans when properly cleaned and cared for while lending a unique aesthetic and spatial touch. Eliminate frustrating and even harmful sun glares while holding onto bright, natural light. Research shows that offices with more natural light report employees with stronger mental and emotional wellbeing while at work. Businesses and other commercial entities with ample natural light also see boosts regarding their customer satisfaction rankings. The psychological benefits of maximizing natural light while minimizing glares affect nearly anyone who enters your space. For parts of buildings with few windows or access to exterior walls, architectural glass like reflective glass can disperse what light is available. Other options — like matte satin partitions — can mute indirect lighting’s glares and shadows. Custom finished glass opens your organization up to a new design feature: etched glass signs. Architectural sign designs complement the visuals and installments already in place. Similar to other marketing messages, architectural signs help brand your space, creating an atmosphere that’s aesthetically and energetically aligned with your company. With these strategies, you can give your building a personality that people pick up on as soon as they enter the room. Private office buildings, commercial spaces and service organizations are the largest consumers of energy in the United States. Of their energy footprint, as much as a third goes to lighting, and more than two-thirds to lighting and temperature-related building controls combined. Implementing natural light enhancements can save these organizations nearly 30 percent on energy costs and sometimes even more. Adding architectural glass films, tints and finishes blocks sunlight from over-warming rooms during summer months and keeps temperatures regulated. Likewise, it draws in and directs appropriate amounts of sunlight to where you actually want it through chosen treatment textures and finishes. Privacy glass is also easy to care for. Glass signage, dividers and partitions can be cleaned in minutes using simple glass-cleaning solutions and a microfiber cloth. No more curtain dry cleaner required. Glass signage is only the beginning. When you partner with SpeedPro, you get a full-service visual communications studio with hundreds of glass colors, cuts, patterns, films, tints, laminates and privacy levels printed under its roof — then placed under yours. Quality and customization are our promises to you, and we let them guide our every customer interaction and order. Reach out to a consultant at your local SpeedPro studio to let us prove it to you through our architectural signage and glass-finishing services.